Walk your way to a happy, healthy life. When was the last time you went for a walk? Where did you go? What was it like? It’s fairly obvious that walking is good for you, but just how good? Previous research has shown that walking is a great form of exercise. It’s perfect for maintaining physical itness and keeping your weight under control. It can also prevent heart disease and reduce the risk of cancer and diabetes. 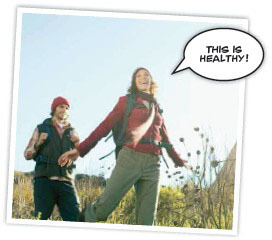 And walking is a proven means of improving your mood,relieving stress and evencombating depression.